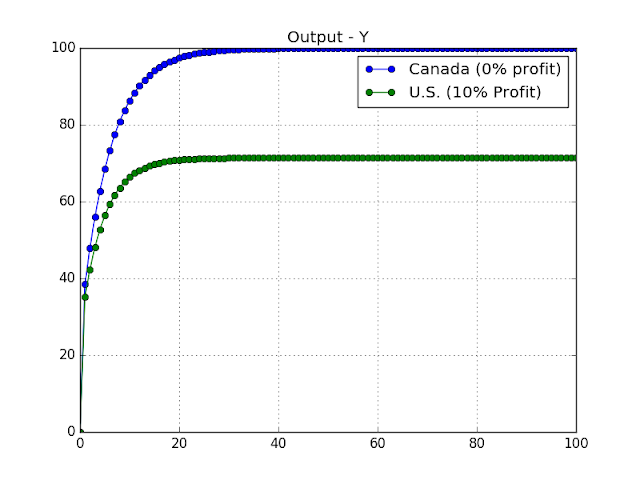 In this article, I tweak the simplest Stock-Flow Consistent (SFC) model ("model SIM") to demonstrate the effect of hoarding behaviour on an economy. 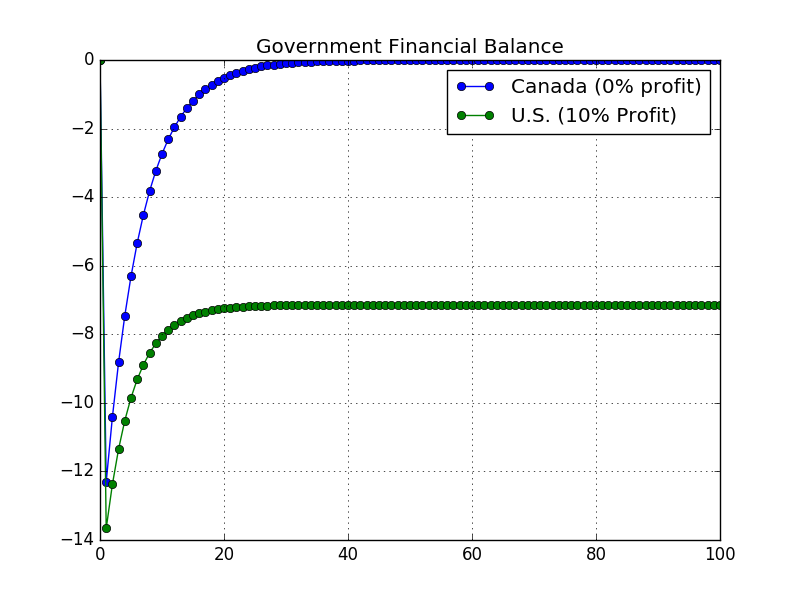 This example is not meant to be entirely realistic (improvements are discussed), but I use it as an example of how the ability to tweak models provide a good platform for learning about economics. (The advantage of my Python modelling library is that it should allow users to easily make such tweaks, without having to do laborious algebra.) At the end of the article, I have a digression which explains how this fits in with the whole "whither economics?" debate that has shown up in recent internet discussion (on my site, and elsewhere). The normal starting point for learning about a field is to pick up an undergraduate textbook. Within economics, this strategy generally does not work. In order to be comprehensible to undergraduates, a textbook consists mainly of two types of material. Simple models that undergraduates can reproduce on an exam, which are supposed to illustrate various principles. If we look at mainstream undergraduates textbooks (and most of them are mainstream), the rote learning aspect is entirely reasonable, whereas the models are an unmitigated disaster. As a result, I believe that people interested in economics should pick up an undergraduate textbook, read the definitional parts, and not read any text that discusses economic behaviour. There is at least one exception that I am aware of -- Godley and Lavoie's Monetary Economics. The focus on the book is on the models, but it is tied in with the background material (if you read the text, and not just jump to the mathematical bits). The difficulty with the methodology used therein is that the equations are derived by hand, and there are lots of equations. It is difficult to play around with the models, and see how they behave. One of the peculiarities of SIM is that business profits are assumed to be zero, and that property helps eliminate business sector behaviour from the model. This has to be done to make the model the simplest possible, as otherwise business sector behaviour adds new dynamics. The results above show total output (GDP). What we see is that for this simple model, profits are bad for output.Both countries converge to a steady state value, but the steady state is lower in the "United States". The chart above explains the root of the problem. 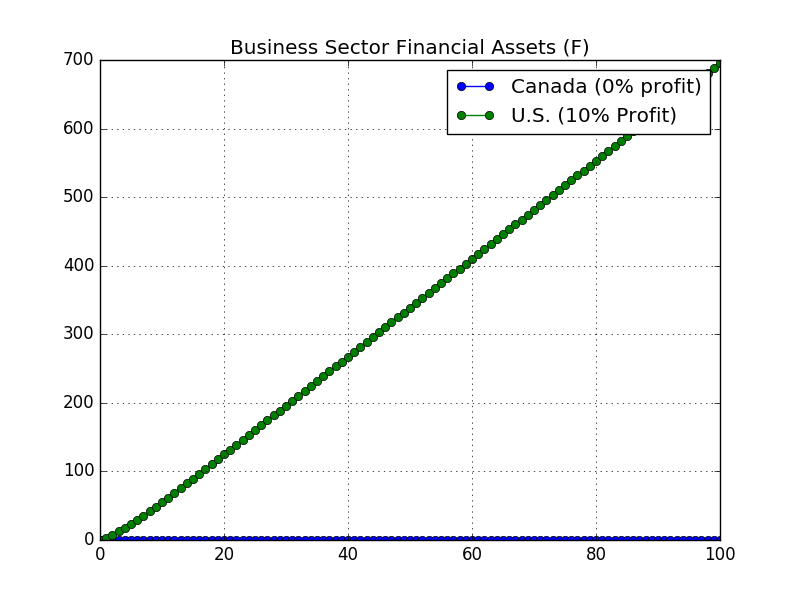 The business sector in the United States is assumed to always have positive profits, and it uses those profits to increasingly hoard financial assets. It would be quite easy to imagine the thinking of the hypothetical people living inside the model. One would imagine business leaders in the United States wringing their hands about persistent government budget deficits (and exploding debt-to-GDP ratio), but that is entirely the result of their hoarding behaviour. If we lump pension funds and mercantilist central banks within the "business sector," there is an analogy to what is happening in the real world. However, these analogies are stretched. The problem is that this model has removed capitalists from capitalism. We need to see what happens when profits are recirculated via dividends. If we do, we get more sensible-looking steady state behaviour. My modelling framework supports that step, and it will probably be the subject of a follow up article (which will be delayed, as I have a backlog of rants to cover). These outsiders with visions of reinventing macro ignore one point: there is not a whole lot of debate about the "rote learning" parts of textbooks. Yes, there are debates about how classify transactions within the national accounts (and how they should be constructed), but no serious economist debates how the national accounts are currently constructed. 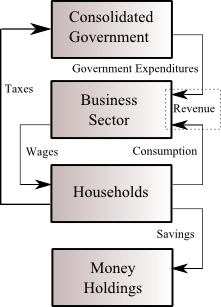 How do economic entities behave? How should economies be organised ("normative" debates)? I seriously doubt that a physicist is going to settle the latter question (normative debates) any time soon. As for the question of economic behaviour ("positive questions"), all I can say is: good luck. Take the current situation in Canada. The housing market is over-extended in a fashion very similar to that in the United States in 2007. Any economic forecast has to be conditional upon the outlook for housing. However, the odds of creating a mathematical model that can correctly forecast inflation, unemployment, and the housing market simultaneously are slim. The best we can hope for is to have a framework to position our thinking about the economy, in particular the effect of policy changes. Stock-Flow Consistent models provide such a framework. My hope is that my Python module will make it easier for people to work through the basics of how the economic sectors fit together, and understand how the behavioural debates affect observed economic behaviour. Actually playing with the models is superior to reading stories about them, as the story telling needs to be validated. "but no serious economist debates how the national accounts are currently constructed." I'd question whether they should be national. There's a bit of an issue with them being in a reporting currency - which means there is implied conversion of denominations hidden in there. And it promotes the 'this economy and the rest of the world' viewpoint - rather than a roughly peer level network interaction of currency zones. The good reason why they are national is the reality of getting the underlying data. National statistical agencies are well, national. The U.S. Bureau of Economic Analysis is not going to be particularly happy with working with data provided by developing countries that are dollarised. One could imagine theoretical models of such a form, but they cannot be compared to observed data. A while ago I studied the balance sheet expansion of the aggregate bank sector. 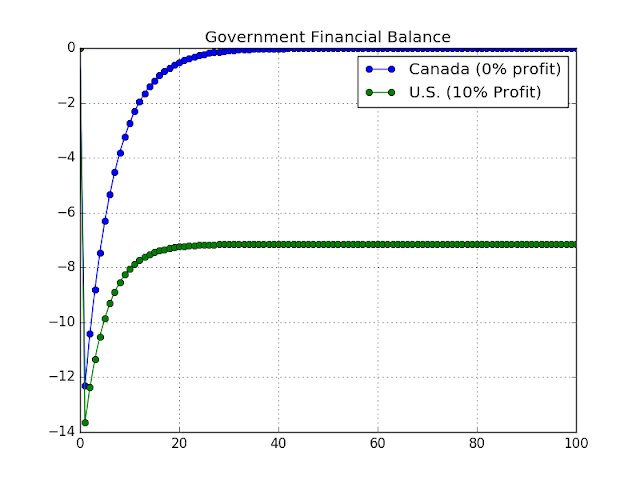 I let profits = revenue - expenses (simplest model) and assume the aggregate bank makes profits over time. When any bank makes a profit it should initially accumulate reserves. This means reserves would grow for the aggregate bank if nothing else occurs. However, the central bank provides reserves to the aggregate bank, and reserves generally do not grow unless a financial crisis forces the central bank to provide more reserves. This means the banking sector would be "investing" profits in the purchase of securities and expansion of loans rather than accumulating reserves. The record of accumulated "profits" would be in the adjusted equity. During a financial crisis the write-off of bad loans destroys adjusted equity and paid-in equity, spooks away depositors and makes it harder for banks to get borrowings, and this forces the central bank to provide reserves in the liquidity cushion. In a non-financial growth firm the "profits" would convert to an increase of non-financial assets. If the valuation of non-financial assets is driven up faster than liabilities of the firm then the shareholders recognize past profits as asset valuations, less debt, less paid-in equity. The equity claims of ownership to banks and firms relate back to households and not-for-profit organizations. So net lending/borrowing in financial accounts should be resolved in the household sector. 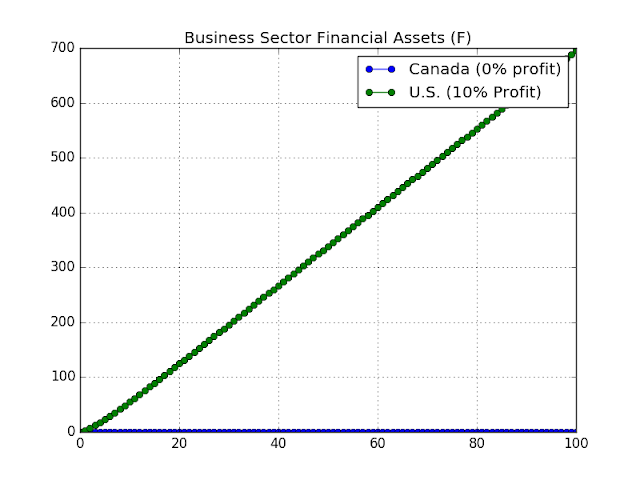 In the nonfinancial sector, profits would generally show up as increased financial asset holdings. Nonfinancial assets only increase as a result of investment. I agree with your points about bank profits and bank balance sheets. Note bank equity and other bank liabilities are held by non-bank share owners, depositors, and lenders. If the firm has a sales and profit growth opportunity it should convert retained earnings (adjusted equity) to an investment in assets other than cash deposits to grow its sales and future profits. The only financial asset that expands in a firm pursuing rapid sales growth is accounts receivable. This assumes, of course, the firm must use nonfinancial assets funded via retained profit, equity, and debt to operate its line of business.